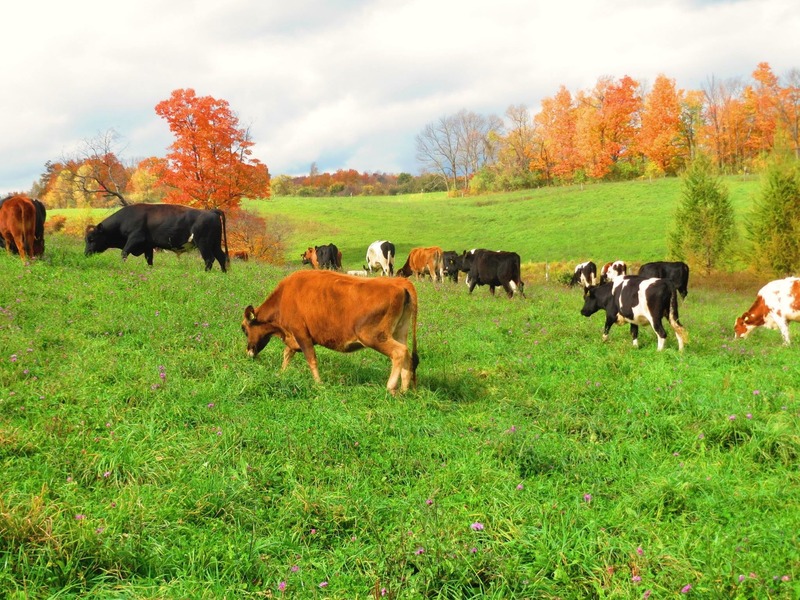 Stockpiling forage and grazing through the winter – great idea, right? But sometimes you don’t want to be the first one to try a great, new idea. That’s where The Grass Whisperer, Troy Bishopp, comes in. He’s starting to graze his stockpile now and he’s going to take you through the season with him. You’ll get to see first hand how it works, the challenges he faces, and how he makes it work. The herd returned from the pasture we rent at Wightman Farm on October 17, so the experiment has already begun. At Bishopp Family Farm we custom graze organic dairy heifers. They’re at the farm for a year starting January 20. Then they head back to their owners to calve and we bring over their younger sisters to start the whole process over again. I have stockpiled and grazed during the fall and winter in the past, even while mending from a heart attack. This year, I’m inviting you along for the ride. A lot of forethought went into this idea of increased grazing days and reducing hay feeding with an eye toward more overall profit for the custom grazier and his customers. I want to share the planning that went into it and how it works, to give you a better idea of what you might be facing as you make a similar change. Every year I manage my pastures and herd and track my progress using planned grazing charts that were developed by Holistic Management Internationl (HMI) and enhanced as part of a Northeast Sustainable Agriculture Research and Education Professional Development Project with the help of graziers, conservation professionals and grazing experts. Grazing charts help me make the best use of my pastures, make critical decisions and also help me schedule time with my family and friends. After all, all work and no play makes anyone a dull boy/girl! 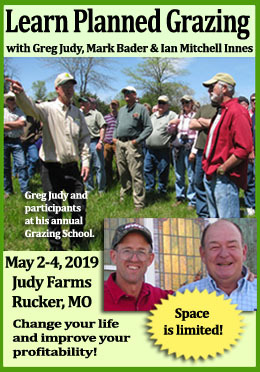 You can download my grazing chart for this year here so that as you follow along you can see how you can use the chart yourself. 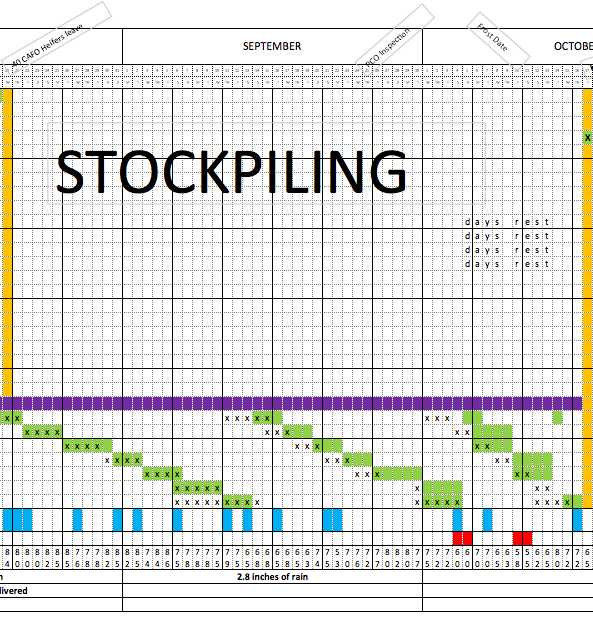 Below is a snap shot of my grazing chart showing pasture rest and stockpiling. Below the purple line you’ll see that the herd is off at the Wightman farm grazing pasture we rent. The black “X”s show what I planned for the animals to be grazing. The green squares show what actually happened. 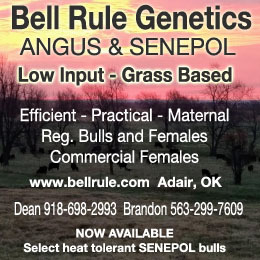 So you can see how I adjust based on my pasture performance and herd needs. Of course stockpile grazing isn’t something you want to go into without planning ahead a bit. 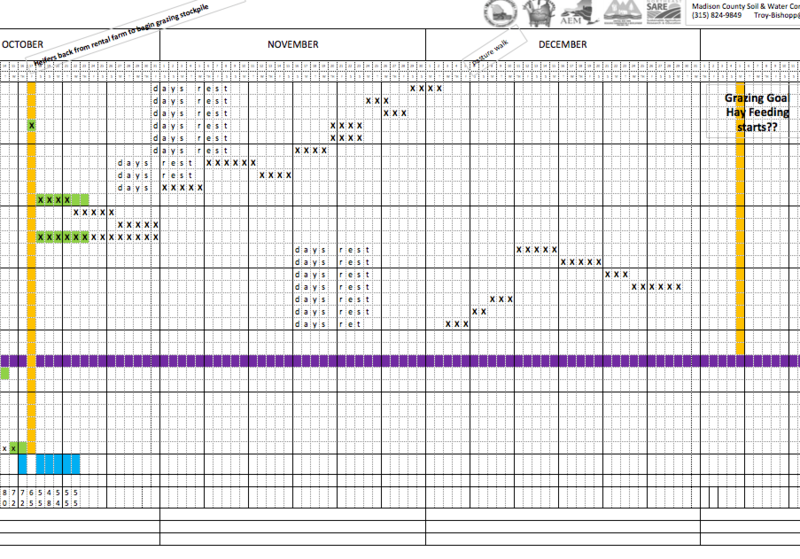 Below is a snapshot of my grazing chart showing my plan for the fall and winter grazing shown by the black Xs. The herd has already started in on the stockpile so you can see the green boxes showing what they actually grazed. As you can see, they’ve already spent more time in one of the pastures than I expected, which is a good thing! I’ll describe what I did, what I saw, the decisions I made and why as we go along together. I’m also going to be collecting and sharing soil samples and forage samples as I go so we can look at the quality of both. This will help me see how I’m doing at meeting soil health needs by the way I manage my grazing, and also if the forage is meeting my animals’ needs. We’re also coordinating a pasture walk on December 6, 2014 so that if you’re in the area you can come by and see how this works. 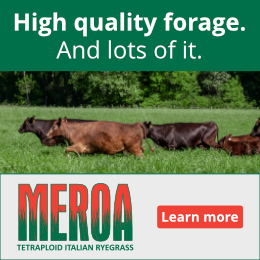 With this first video you’ll learn a little more about our farm and you’ll see how much forage I’ve saved up for the dairy heifers, bulls and a couple of cow calf pairs to graze. You’ll get to see my math for figuring how much forage my herd will need, and how many days I think the stockpile will last for them. Then I’ll be back here periodically to show you how it’s going or you can check in on my blog for weekly musings. Think of it as reality TV for the farmer. My hope is that my example, with the good parts and the mistakes or challenges, will help you see how you can do this on your own place. I look forward to your thoughts, questions and suggestions as we see the future come together. Here’s the link for you tablet folks. Comments on water,shelter and BCS? Will you be strip grazing? Troy, a British farmer said winter was more a problem of the mind than of snow.